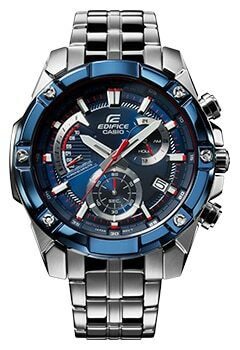 Tokyo, April 10, 2018 — Casio Computer Co., Ltd. announced today the release of new additions to the EDIFICE line of metal sport watches, which combine dynamic design with advanced technology. 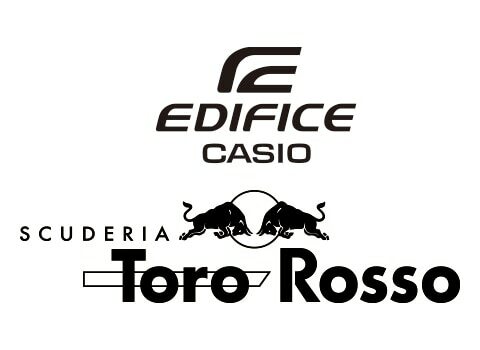 The new EQB-900TR-2A, EFS-S520TR-1A, EFR-559TR-2A, and EFR-559TRP-2A watches are the fourth series of partnership models with the Formula One racing team Scuderia Toro Rosso. Scuderia Toro Rosso brings youthful energy and passionate pursuit of speed, pairing those with racing cars powered by outstanding technological innovations. 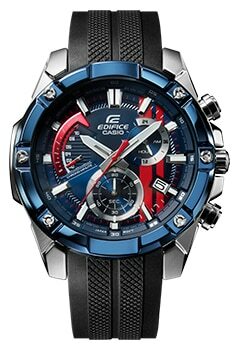 Casio believes that these qualities perfectly match the EDIFICE brand concept of "Speed and Intelligence" and has supported the team as an official team partner since January 2016. 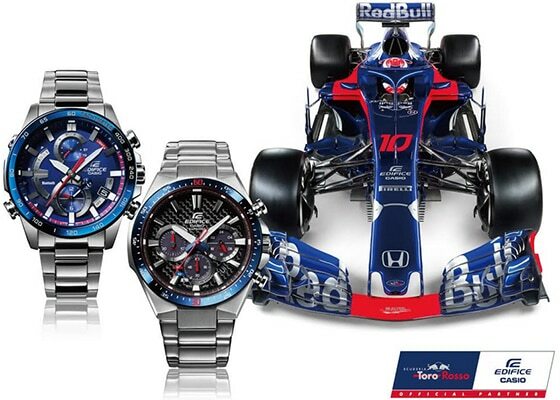 The four new models feature color schemes inspired by the race cars of the Scuderia Toro Rosso team. The blue base color is accented with striking red lines and silver inset dials and index marks. 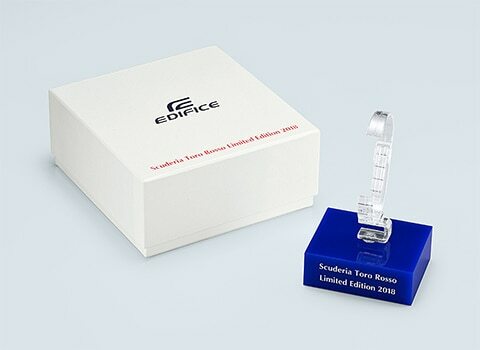 All four models feature Scuderia Toro Rosso logo engraved on the back case and come in special packaging. 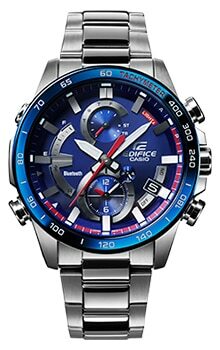 The EQB-900TR-2A is based on the EQB-900 model in the series of EDIFICE watches that link to a dedicated app on a smartphone using Bluetooth®. 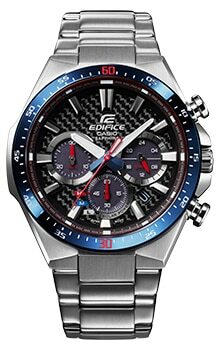 The EQB-900 is popular for its bold design and case size, which is smaller and lighter than any other EDIFICE watch that links to a smartphone. The watch keeps accurate time anywhere in the world by automatically connecting four times per day to a time server through a paired smartphone. The EFS-S520TR-1A is a solar-powered watch that features a dial made from carbon fiber, which is extensively used in racing cars. The watch features a solar panel on each of the three inset dials and a face made from scratch-resistant sapphire glass. The EFR-559TR-2A and EFR-559TRP-2A feature bezels, index marks, and hour and minute hands that have a presence all their own to achieve a bold and sporty look. The watches also feature retrograde inset dials at the 2 and 10 o'clock positions that convey a strong motor sports feel. After data is transferred to a smartphone with the Mobile Link function, the app can display the list of lap times in units of 1/1000 seconds (up to 100 log records) and a graph of lap times. The app can also highlight the records that surpassed laps where the best time was achieved. The Bluetooth wordmark and logo are registered trademarks of Bluetooth SIG, Inc. and any use of these marks by Casio Computer Co., Ltd. is under license.